Decisions about health care will increasingly be based on evidence that, when applied to the individual circumstances of a patient, supports the efficacy and cost-effectiveness of one course of treatment over another. In the new world of health care, providers are striving to achieve better outcomes through enhanced quality and improved efficiency. To that end, health care stakeholders are developing innovative ways to deliver care to advance patient health. Contributions to that effort have come from a variety of sources, none more important than the NACDS ­Foundation. In recent years, the education, research and charitable arm of the National Association of Chain Drug Stores has become a catalyst for a rigorous exploration of new ways to improve patient care and public health. The foundation is doing so by supporting evidence-based research to evaluate novel approaches to health care delivery and interventions to enhance outcomes and reduce overall costs. 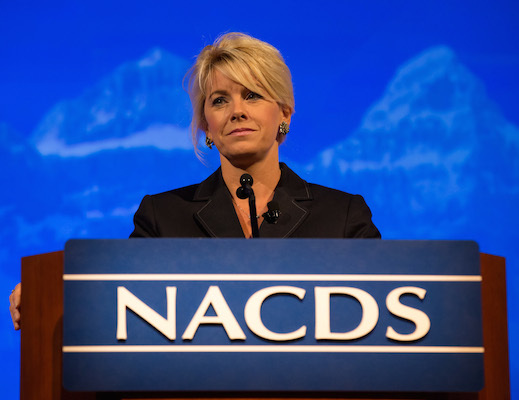 The transformation of the foundation into a leader in health care research has been directed by Kathleen Jaeger, its president, who is also senior vice president of pharmacy care and patient advocacy at NACDS. A pharmacist and attorney by training, Jaeger had extensive experience in health care before she joined the foundation in November 2011, having served as president and chief executive officer of the Generic Pharmaceutical Association and executive vice president and CEO of the National Community Pharmacists Association; prior to that she was a partner in an international law firm. Jaeger quickly grasped what was needed at the foundation and put together a three-year strategic plan designed to advance the health of patients and communities through evidence-based research, making it the focal point of the organization’s work. Now in its third year, the research portfolio, which involves the funding of over 15 diverse projects, is producing impressive results. The persistent problem of medication nonadherence, which adversely affects the health of countless patients and leads to complications that cost the nation an estimated $290 billion a year to address, was explored by researchers at Harvard University and the University of Mississippi. By utilizing novel interventions by pharmacists, they were able to achieve significant improvement in adherence rates among participating patients versus those in a control group. Two major initiatives nearing completion comprise five projects that examine the impact on patient health of emerging care models and point-of-care testing in a pharmacy setting for such conditions as influenza and group A strep. The emerging care model program — which involves three projects led by the University of Iowa, the University of Nebraska Medical Center and North Dakota State University, working with Blue Cross Blue Shield, OutcomesMTM, Prime Therapeutics, the Community Pharmacy Foundation, Thrifty White and Walgreens — is attempting to determine whether the incorporation of advanced medication therapy management services in new care paradigms leads to better patient ­outcomes. Other work funded by the NACDS Foundation focuses on transitions in care, and how neighborhood-based delivery of care can improve access and save time in the treatment of minor health issues, including allergies, nausea and common infections. The transitions-in-care program, which receives financial support from Cardinal Health, looks at what can be done to solve the problems that often arise when a patient moves from one health care provider to another, usually after being discharged from the hospital. Participants in the ongoing research projects include Medicine Shoppe, Kroger, Walgreens, Geisinger Health Plan, the University of Cincinnati and the Mississippi Division of Medicaid. The research teams hope to determine whether care coordination, prescription drug reconciliation, and tracking medication use by hospital providers and community pharmacists can enhance results for such patients. With input from the NACDS and foundation boards, Jaeger will begin a strategic assessment of the NACDS Foundation later this year. Her findings will be presented to both boards at NACDS Week in New York at the end of the year. Based on the number, variety and caliber of the entities that have chosen to work with the foundation, the research program has struck a chord with stakeholders interested in helping patients while making health care more efficient. The findings stemming from the work supported by the NACDS Foundation comprise a valuable resource for advocates of improved health care as they strive to achieve those goals.